Duncan Watmore signed a new four-year deal earlier this month. Sunderland striker Jermain Defoe has compared the emergence of team-mate Duncan Watmore to that of Real Madrid forward Gareth Bale. 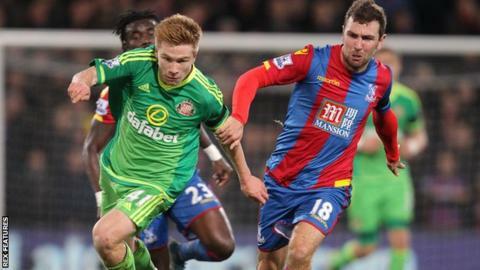 Forward Watmore, 21, signed a new four-year deal earlier this week and has made six appearances this season. Defoe previously played alongside Wales international Bale, 26, at Spurs. "In a funny way he reminds me of Gareth. When he came on the scene at Tottenham, he used to just get the ball and glide," the 33-year-old said. "He's such a nice boy, I don't think he's bothered about signing new contracts and stuff, all he wants to do is play football and do well for the club. "If he can go on to do what Gareth has done then he'll be fantastic. He's the future of this club." Former Toronto and West Ham forward Defoe has started only two of the five games played under new manager Sam Allardyce, but has been involved in them all and scored the 80th-minute winner in the Black Cats' first away victory of the season at Crystal Palace on Monday. He insisted that age is not a factor when it comes to team selection. "I'm 33 - it's not an issue. If it was an issue then I wouldn't have performed like I did (against Palace)," Defoe told BBC Newcastle. "I'm not one of those players that will sulk at training because I'm not playing. If I do that I'm only harming myself because when I get those chances I won't be ready."